Recently, a group of high ranking Canon officials received 20 journalists from Indonesia, Cambodia, Vietnam, Sri Lanka and Pakistan. 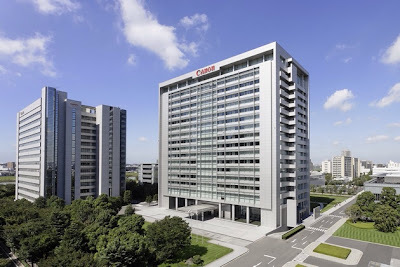 The meeting was held at the headquarter of Canon Inc. in Shimomaruko, Tokyo, Japan. Tatsuo Yoshioka, Senior General Manager ICP Strategic Management Planning Center – Image Communication Products Operations Canon Inc., said that the compact and video camera market decreased in 2013 but the DSLR market increased by more than 10%. Ken-ichi Shimbori, Advisory Director – Group Executive ICP Group 2 – Image Communication Products Operations Canon Inc., head of the DSLR group, presented the market shares: 45% in the world and 43% in Asia. The merit, according to Mr. Shimbori, goes to three key concepts featured on Canon DSLRs: fast AF, easy operation and high image quality. Mr. Shimbori said the EOS-6D is the most compact and lightest full-frame camera in the world. The reason for the high image quality relies in the gap-less microlenses featured on Canon’s digital sensors. Masato Okada, Executive Officer – Group Executive of ICP Group 1 – Deputy Chief Executive of Image Communication Products Operations Canon Inc., said that the supremacy of Canon DSLR cameras is related to the high quality of Canon’s EF lenses. You can read the full article by visiting this website.